Michael Hogue, professor of pharmacy and associate dean of Samford University’s Center for Faith and Health, has been named president-elect of the American Pharmacists Association (APhA) after a national election. He will serve as president for the 2020-21 term. Hogue is the first Samford pharmacy faculty member to serve in this prestigious role. Founded in 1852, APhA is the oldest and largest pharmacy organization in the United States. For the past year, Hogue has served as trustee and speaker of the APhA House of Delegates, and he will sworn in as president-elect at the APhA 2019 Meeting in Seattle, Washington. Hogue is a ’96 alumnus of Samford’s McWhorter School of Pharmacy, and he joined the school’s faculty in 2004 after serving in a variety of roles within pharmacy, including owner of a community pharmacy, co-owner of a home infusion company and ambulatory care clinical pharmacist. Hogue is highly regarded as an expert in the area of immunization practice, vaccines and vaccine-preventable diseases. He served as chair of McWhorter School of Pharmacy’s Department of Pharmacy Practice from 2008-2016 and interim dean from 2013-14. 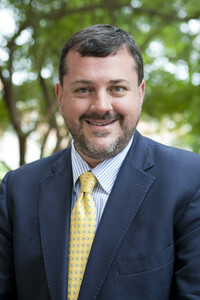 With the creation of the College of Health Sciences, Hogue was named associate dean for Samford’s Center for Faith and Health, which supports the engagement of missions and service learning opportunities for students and faculty within the college’s four schools: School of Health Professions, Ida Moffett School of Nursing, McWhorter School of Pharmacy and School of Public Health. “I wake up each day excited about the future of the pharmacy profession, and I’m excited to be a part of it in this way. APhA does amazing work in advocating for our profession as well as our patients,” Hogue said. Hogue is also a fellow and distinguished practitioner of the National Academies of Practice.